Louisville Boudoir and Pinup Photographers: Join Boudoir Louisville at the OLD SLED WORK'S SLED FEST in Duncannon Pennsylvania! 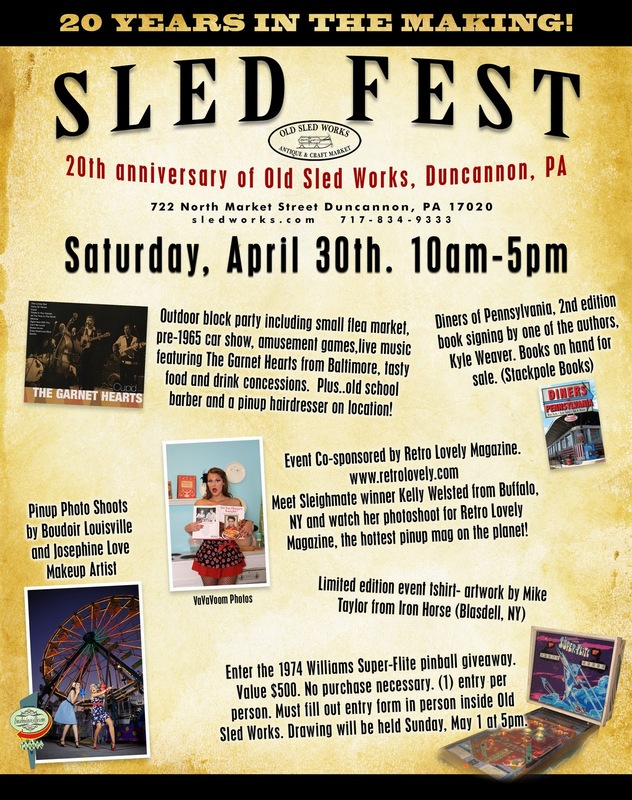 Join Boudoir Louisville at the OLD SLED WORK'S SLED FEST in Duncannon Pennsylvania! Boudoir Louisville will be booking pinup photo shoots the whole weekend of the Old Sled Works Sled Fest. Contact us for more info or to reserve your spot. Saturday, April 30th. 10am-5pm Outdoor block party including small flea market, pre-1965 car show, amusement games, live music featuring The Garnet Hearts from Baltimore, tasty food and drink concessions. Plus..old school barber and a pinup hairdresser on location! Event Co-sponsored by Retro Lovely Magazine. www.retrolovely.com Meet Sleighmate winner Kelly Welsted from Buffalo, NY and watch her photoshoot for Retro Lovely Magazine, the hottest pinup mag on the planet! Pinup Photo Shoots by Boudoir Louisville and Josephine Love Makeup Artist. Enter the 1974 Williams Super-Flite pinball giveaway. Value $500. No purchase necessary. (1) entry per person. Must fill out entry form in person inside Old Sled Works. Drawing will be held Sunday, May 1 at 5pm.